MMS. Miracle Mineral Solution. CD. Chlorined Dioxide. Call it what you want, it’s a scam. Worse than that, it’s abusive. And thankfully it’s getting some national news attention. MMS/CD whatever you want to call it, is sold with a bunch of science-sounding mumbo-jumbo. Believe me (a Ph.D. scientist with 30 years of experience), the explanations given by people like Kerri Rivera and Jim Humble for what MMS does amount to science nonsense. Thank you ABC for taking this on. Please don’t walk away from this story, keep on it. We need this abuse to end. An Illinois doctor who subjects autistic children to “unwarranted, dangerous therapies” must have her work reviewed by an acupuncturist. The state medical board also fined Dr. Anju Usman $10,000, ordered her to take additional medical education classes, and placed her on probation for at least one year, as part of her plea agreement with state regulators. The acupuncturist, Dr. Robert Charles Dumont, is a pediatrician, and a member of the faculty of the Integrative Medicine Department of Northwestern University School of Medicine. According to the consent decree, Usman “shall submit ten active patient charts on a quarterly basis” to Dumont. When asked if Usman is allowed to select which charts will be reviewed, a medical board spokesperson referred the reporter to the language in the consent decree. Usman suggested to regulators the doctor who will be reviewing her charts, according to Usman’s attorney. Usman is director of True Health Medical Center in Naperville, Illinois and owner of Pure Compounding Pharmacy. She a is regular presenter at Autism One, an annual gathering of vendors, providers, quasi-researchers and desperate parents. The complaint against Usman was filed by the boy’s father in 2009. A year later, he sued Usman and Dr. Daniel Rossignol of Melbourne, Fla. for harming the child with “dangerous and unnecessary experimental treatments.” A Chicago-area lab, Doctor’s Data, was also sued. The plaintiff voluntarily dismissed the suit in 2014, but will reportedly reinstate it in 2015 or later. Usman’s name is also connected to the 2005 death of Tariq Nadama, a five-year-old boy who died at the hands of Dr. Roy Kerry. Usman diagnosed the boy with high aluminum levels, then referred him to Kerry, an ear-nose-throat specialist in Pennsylvania. Kerry treated the child for lead poisoning, even though his blood lead levels were below that which indicates the need for chelation. Book Review: Do you believe in magic? The science and nonsense of alternative medicine. The name Paul Offit is fairly well known in the autism communities. He has spent considerable time countering the false idea that the rise in autism diagnoses seen in the past is due to an epidemic of vaccine injury. He spends most of his time as Chief of Infectious Diseases at the Children’s Hospital of Philadelphia. He is co-inventor of a vaccine which protects infants against rotavirus. Dr. Offit has written a number of books including one on autism: Autism’s False Prophets and one on the anti vaccine movements, which includes large sections on autism: Deadly Choices, How the Anti-Vaccine Movement Threatens Us All. 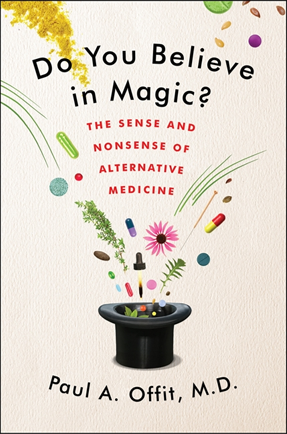 And now he has a new book on alternative medicine: Do You Believe in Magic? The Sense and Nonsense of Alternative Medicine. There are two phrases which come to my mind when I hear about alternative medicine. First is a question: what do you call alternative medicine that works? Answer: medicine. The second phrase is more dark: medical fraud is a multi billion dollar business, and the bad guys know about autism. Alternative medicine is big. Big as in a large fraction of the populations partakes in alt med in one form or another. Big as in it is big business. And, in terms of the subject of this site, big as in alt med is strongly promoted to and popular with the autism communities. Particularly the autism parent community. As with other books by Dr. Offit, Do You Believe in Magic gives both sides of the various stories presented. He usually starts by giving the pro side, in this case the pro side of alternative medicine. For example, he presents the success stories of various alt-med practioners like chelationist Rashid Buttar and faux cancer therapist Stanislaw Burzynski. If you know the background behind a given story (say, Buttar) it can be quite jarring. You know that the claims aren’t true but you read Dr. Offit presenting them like they are. But when you get to the rebuttal it makes it very powerful. The media has focused largely on the topic of vitamins–which does get a lot of play in the book. Dr. Offit points out how they supplement industry got a major boost from legislation which removed oversight on the industry. He also points out examples of how the claims for many supplements are either false (they don’t work) or worse (people on supplements live shorter lives than those with the same conditions who do not take supplements). As this is an autism focused site, I’ll point out the two chapters which focus on autism. The chapters largely center around various personalities and for autism the chapter focuses on Jenny McCarthy–the “pied piper of autism”. The chapter goes into detail–as in three page–listing the various theories of what causes autism (heavy metals, vaccines, misaligned spines, etc.) and the various therapies which are purported cures. Three pages. It’s amazing to see it laid out like that–showing that the alt-med community doesn’t have a real idea of what causes autism. Instead, they have dozens of ideas, sometimes contradictory, sometimes disproved, sometimes just without scientific merit. The second chapter with an autism focus is that on Rashid Buttar. He is a chelationist who includes autism as one of the many conditions he “treats”. He also came to fame recently as the doctor (recommended by Jenny McCarthy) chosen to treat Desiree Jennings, whose story of faux vaccine injury became a YouTube phenomenon. 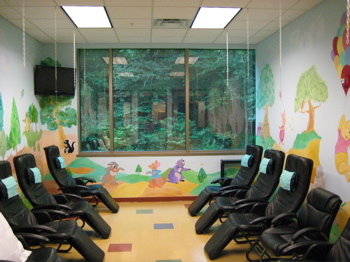 In case you don’t recall him, here is Rashid Buttar’s IV chelation suite for children, complete with Disney characters painted on the walls. Yes, there is room for 10 kids to receive IV chelation at the same time. Which is a small example of how this is big business. Dr. Offit makes the point even more clearly, with Dr. Buttar as one example. Many millions of dollars have been spent by patients on Dr. Buttar’s concoctions–some of which have been clearly shown to do nothing. Some people are getting very rich in the alt-med business. Very rich. Rashid Buttar is one. Stanislaw Burzynski is another. His cancer therapies are amazingly expensive, make no sense and are a grand example of selling false hope. Bookstores are filled with books on alternative medicine. There are very few books which take a critical look at this industry. Do You Believe in Magic is a welcome addition. Unfortunately, it will likely never sell as well as false hope. I recently had the opportunity to meet Dr. Offit. One question I posed to him was simply, why does he stay at a teaching hospital? Given his successes, he could do pretty much anything he wants. His answer boiled down to simply–he is doing what he wants. He has the freedom to say what he wants. On more than one occasion this has led to frivolous lawsuits, and even those haven’t shut him up. In his latest book he takes on faux medicine, practitioners who are making huge profits from it and the leglistors who facilitated the industry. One could ponder who will sue him first except that facts are laid out so clearly as to make it difficult for anyone to do so. Dr. Anju Usman, a familiar face at anti-vaccine conferences in the US and abroad, allegedly lied about or exaggerated the value of treatments, and “demonstrated extreme departure from rational medical judgment” and “abused the patient/physician relationship.” Regulators are moving to have Usman’s medical license revoked or suspended, or otherwise disciplined. The complaint, filed Wednesday, revolves around Usman’s care of a boy diagnosed with autism whose treatment was described in the Tribune’s series “Dubious Medicine.” The series detailed the many unproven therapies prescribed for the boy and found that many alternative treatments for autism amount to uncontrolled experimentation on children. According to the complaint, the boy began seeing Usman shortly after he was diagnosed with mild to moderate autism in the spring of 2004. He was not yet two. Usman allegedly diagnosed the child with a calcium-to-zinc imbalance, yeast, dysbiosis, low zinc, heavy metal toxicity and abnormally high levels of aluminum, antimony, arsenic, cadmium, copper, lead, nickel, silver, tin, titanium, and selenium. Usman is the defendant in a civil suit filed by the boy’s father in 2010. Also named are Dan Rossignol, a Florida DAN doctor; and Doctors Data, a Chicago-based laboratory that performs tests used to convince patients that they have dangerously high levels of lead, mercury, or other heavy metals that require “detoxification” to reduce these levels. Usman is also associated with the 2005 death-by-chelation of five-year-old Tariq Nadama. According to court records, Usman diagnosed the boy with “high aluminum” and referred him to Roy Kerry, a Pennsylvania physician. Kerry, an ear-nose-and throat surgeon, inexplicably treated the boy for lead poisoning. “We don’t have the entire record at all. Mother left her entire volume of his records home. But we have been in communication with Dr. Usman regarding EDTA therapy. He apparently has a very high aluminum and has not been responding to other types of therapies and therefore she is recommending EDTA, which we do on a routine basis with adults. We therefore checked him to it … But on testing for the deficiency indicator we find him only indicating the need for EDTA at the present time. Therefore we agree with Dr. Usman’s recommendation to proceed with the treatment. She recommends 50mg per kilo. He is 42 pounds today. So we’ll treat him with a 20-kilo child and give 1 gram of EDTA. Nadama arrested and died in front of his mother during the third chelation round in August, 2005. A year later, Kerry was certified as a DAN doctor after completing an eight-hour training course. Prosecutors declined to charge Kerry for the death, and the state medical board suspended his license for six months and ordered extra training. Usman spoke at AutismOne in Chicago last May, a cult-like annual gathering that expels skeptical writers and news reporters. Her topic: Prevention & Raising Healthy Kids in a Toxic World. A handful of “outraged” anti-vaccine activists occupied part of the sidewalk at the corner to 6th Ave. and 52nd St. today and listened to other angry anti-vaccine activists promote an anti-vaccine book and denounce Bill Gates. The protest and press conference against Microsoft founder and Chairman Bill Gates challenges his controversial remarks on national TV that those who question vaccine safety “kill children.” The attendees are demanding an immediate apology from Gates. The press conference will take place outside the Microsoft Executive Offices at 1290 Avenue of the Americas (corner of 52nd Street) in Manhattan. These groups will hold additional protests in Manhattan, Long Beach and Omaha where Gates will be speaking publically. Gates’s actual words, spoken in a February 4 CNN interview, were aimed at leaders in the anti-vaccine movement who mislead parents into leaving their children vulnerable to dangerous diseases. Well, Dr. Wakefield has been shown to have used absolutely fraudulent data. He had a financial interest in some lawsuits, he created a fake paper, the journal allowed it to run. All the other studies were done, showed no connection whatsoever again and again and again. So it’s an absolute lie that has killed thousands of kids. Because the mothers who heard that lie, many of them didn’t have their kids take either pertussis or measles vaccine, and their children are dead today. And so the people who go and engage in those anti-vaccine efforts — you know, they, they kill children. It’s a very sad thing, because these vaccines are important. At least one anti-vaccine press release called on “tens of thousands of outraged parents” to participate in a multi-city event. That event drew about 100 participants to hear disgraced former gastroenterologist Andrew Wakefield denounce vaccines. The southeast corner of 6th Ave. and 52nd St. in Manhattan where not much happened today.